Some movies exist because the filmmakers want you to reflect on the state of the world around you, while others exist solely to entertain. Patrick Hughes’s The Expendables 3 was created for the latter reason – it’s a love letter to action movie fans of the 1980s and 1990s. The film is a two hour explosive dedication to a time when true heroes wore camouflage instead of wearing spandex. The Expendables 3 sees Sylvester Stallone’s Barney Ross track down his former friend and co-founder of his mercenary group, Conrad Stonebanks (Mel Gibson). When Stonebanks injures one of Ross’ men, he begins to contemplate the morality of his team. He cuts them loose, teaming with a younger and faster set (led by Kellan Lutz), however things go wrong and Ross is forced to get the group back together, adding additional firepower (and screen charisma) in the form of Wesley Snipes, Harrison Ford and Antonio Banderas. We’re now three films into the Expendables franchise and things have really started to come together. Sylvester Stallone, the godfather of the series has honed the elements that work, and ditched the ones that simply don’t. The first Expendables had a plethora of action stars, but the bulk of the cast (Randy Couture, Terry Crews etc) weren’t the icons that fans wanted to see. Sure, Stallone shared the screen with Bruce Willis and Arnold Schwarzenegger, but the brief moment only served to whet fans’ appetites and up anticipation levels. The Expendables 2 topped the first one, adding extra Willis and Schwarzenegger, with an added dash of Jean-Claude Van Damme and Chuck Norris. It was a fun thrill ride of a movie, but it somehow felt that the script was written around the availability of the talent. The Expendables 3 however feels like a fully cohesive piece, a star packed actioner that is worthy of sitting beside some of the best of the genres heyday classics. Stallone and director Hughes have finally synthesised the formula, understanding that these films need stars who match their onscreen personas. The addition of Harrison Ford, Antonio Banderas and Mel Gibson really ups the game of The Expendables 3. Ford brings his elder statesman class to the role of the mercenaries’ new ‘handler’(replacing Bruce Willis). It’s great seeing the screen legend relax and play as part of an ensemble, while also getting to help out in a bit of airborne action. Banderas is a revelation as the lone mercenary eager to join the ranks of Stallone’s team. Playing the part with both physical and comedic agility, Banderas is easily the best thing in the film. He gets to riff on his Zorro and Desperado persona, creating a character that really needs more onscreen adventures. Meanwhile, Mel Gibson shows us how foolish Hollywood really is. The star adds depth and screen magnetism to the character of Stonebanks. He might be a cartoon villain, but he’s a three dimensional one. Only a true movie star like Gibson can take a character like this and make it shine on screen. As for Wesley Snipes – it’s clear that he wants to get back into the action fold. Snipes is a ball of kinetic energy and sparky one-liners and the introduction of his character is a play on the real-life time he spent behind bars. He has some good interaction with Jason Statham as the pair vie for the spot of Barney Ross’premier knife-man. It obvious that Arnold Schwarzenegger loves making these movies, and he appears to relish every moment he has onscreen. It’s easy to see the appeal – the Austrian Oak gets to hang out with his action peers, chew cigars, shoot guns, spit out a greatest hits set of his best lines and pickup million dollar paychecks. When Kelsey Grammer was first announced as an ‘Expendable’ it appeared that Stallone and Co may have inadvertently cast the former sitcom star in a flurry of casting confusion, but the Frasier star more than acquits himself as the man who Stallone’s Ross turns to bolster his numbers. 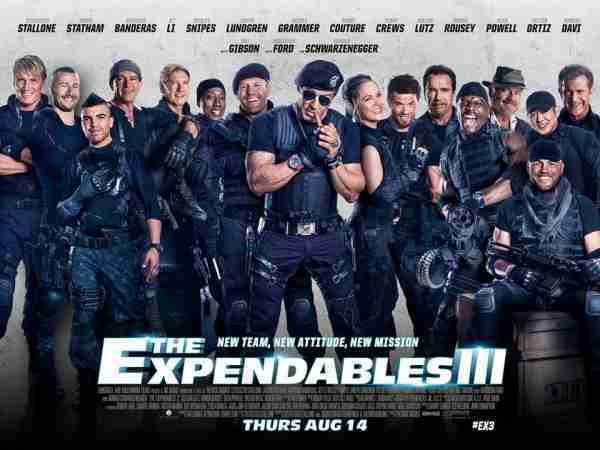 If you delve too deep into The Expendables 3 then you’ll see that it’s implausible and totally far-fetched. Though it’s not pretending to be anything else. It’s a fun thrill-packed action movie with impressive set-pieces, where a great group of stars hang-out and have a good time, on and off screen. The scene is set, the guns are cocked and the action is ready to go. This is what summer blockbusters used to be like in a time before spandex ruled the multiplex.